BioQuest Woods Museum of Life and Science « Jeff Kennedy Associates, Inc. 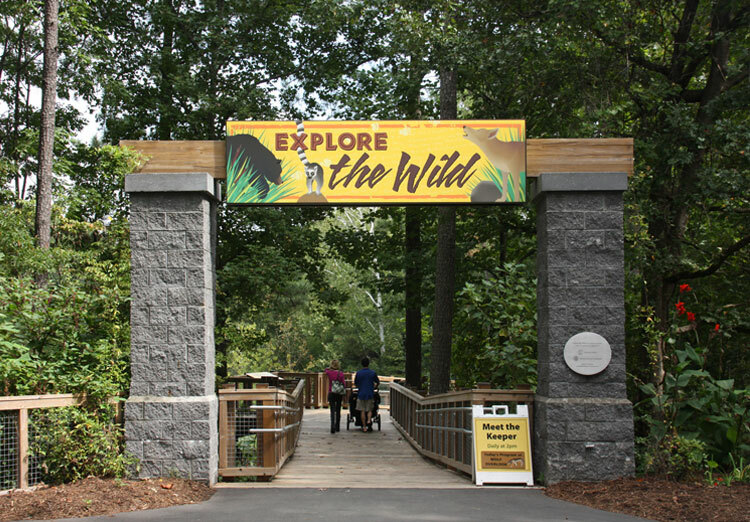 Explore the Wild and Catch the Wind are two thematic areas within BioQuest Woods sharing a 10-acre track within a 20+ acre natural habitat at the Museum of Life & Science, an institution with which JKA has had the privilege of working for more than a decade. Explore the Wild is designed to immerse visitors in nature through a variety of experiences that include observing animal life and engaging in hands-on activities. We collaborated with MLS, project architects and landscape architects over a period of five years as the project went from drawing board to widely-acclaimed opening. 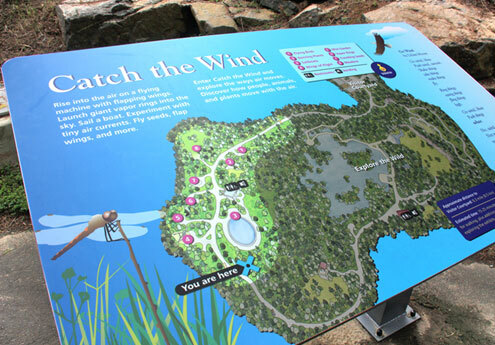 The 6-acre Explore the Wild site is approached on high ground, where a map indicates the pathways and features of the quarry basin of woodland and wetland habitats. 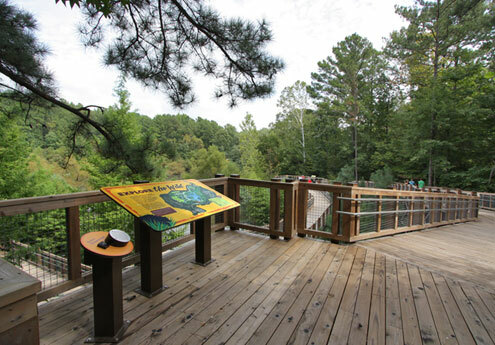 Visitors make their way down into the site along a gently sloping, wheelchair-accessible boardwalk that offers vantage points for viewing live animals. Favorite stops include a black bear alcove, a wetland pond, a red wolf enclosure and a lemur colony. At the black bear alcove, visitors have the opportunity to see the animals in extreme close-up on a video display, using a joystick to control a high-powered camera mounted to a high pole (center of picture). 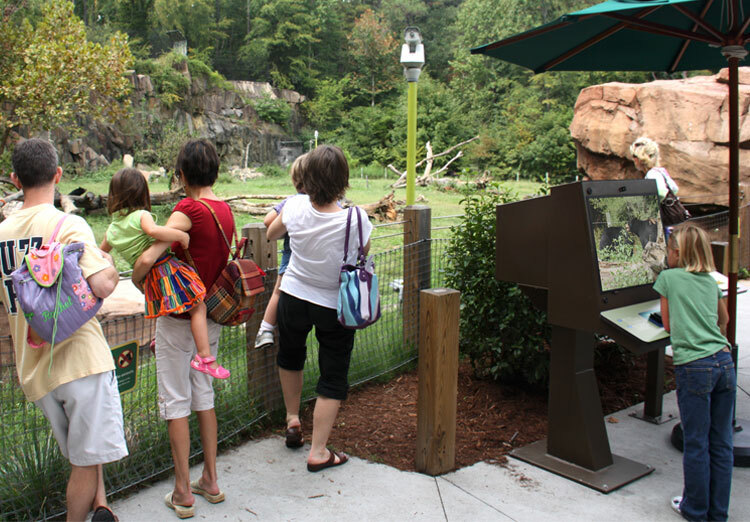 At this habitat and others, care has been taken to locate exhibit components so that nothing disrupts the view. 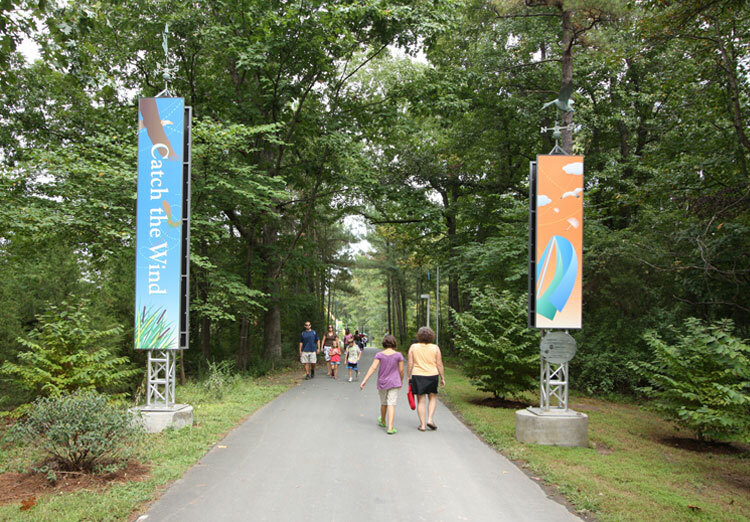 Catch the Wind, the second BioQuest Woods area, showcases the movement of wind through trees and high grasses. Hands-on exhibits provide visitors with opportunities to explore the way air moves, and the ways plants, animals and objects interact with wind. In a landscape of varied environments, large- and small-scaled components are integrated to take advantage of the site’s natural characteristics. An introductory map provide orientation and wayfinding for the features embedded in the Catch the Wind site. A quarter-mile trail takes visitors through the 4-acre knoll on a woodland edge. 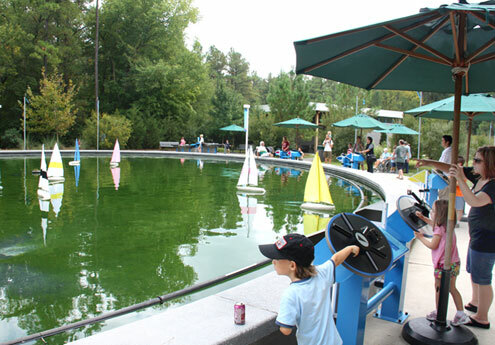 A 5,000 square foot sailboat pond is the centerpiece of Catch the Wind, attracting visitors of all ages. Eight pairs of people can sail at a time, using joysticks to remotely control sail angle and “ship’s wheels” to control rudders. A key project goal was to allow access to a variety of the site’s interesting features. 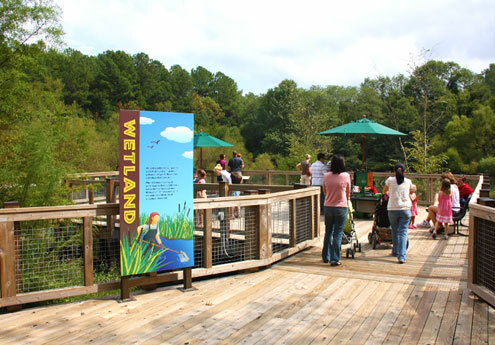 Looking across a swampy area, visitors see a platform that features observing activities and hands-on exhibits for experimenting with water. 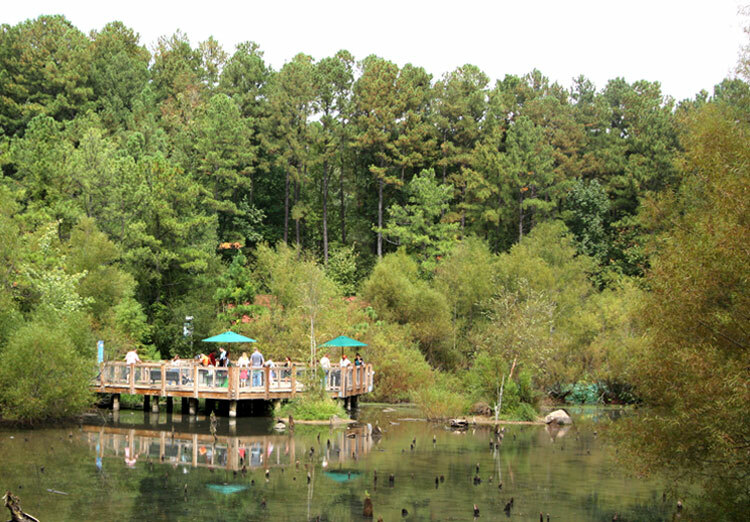 The Wetlands platform extends out over a part of the swamp that otherwise would be inaccessible. An erosion table located on the Wetlands platform allows for open-ended experimentation with the power of running water, bringing home the idea that, even if only a trickle, over time it will change the landscape. 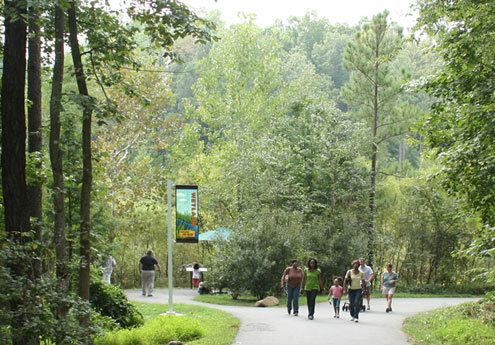 Bioquest Woods takes full advantage of its sprawling, lush site. 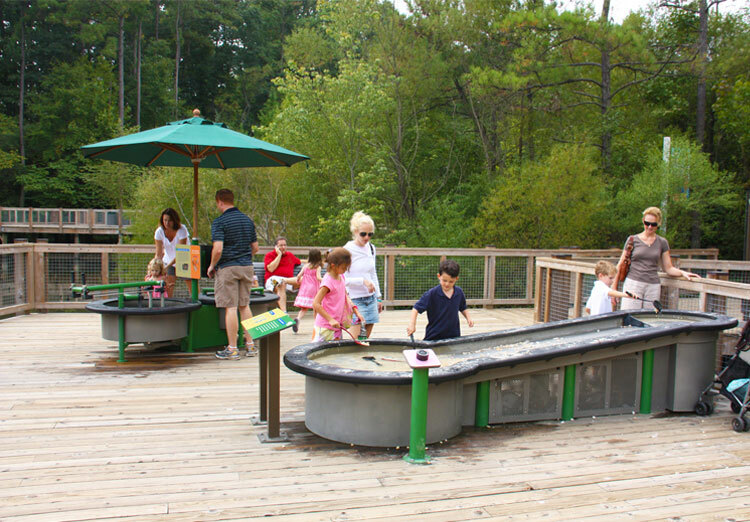 Expanding and transforming the visitor experience within the MLS outdoor domain has proven extremely popular with museumgoers, providing another high-attraction activity area with appeal for a variety of ages and styles of learning.